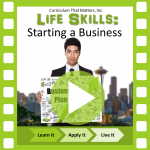 This course will help you understand some of the macro level planning that takes place when starting a business. Mission statements, business structures, advertising, selling online, and establishing a website are topics covered in this course. Write a mission statement for their business. Choose a business structure for their business. Determine which permits and zoning apply to their business. Choose a site for their business. Calculate the costs and selling prices of their products. Design advertisements for their business. Learn how to sell products online.